Way back on 16 May I managed to see my 312 bird species in Queens to add to my Queens list. Somehow I forgot that the last time I predicted what the next ten species I would see in Queens would be was back on 30 December 2013, when my list was sitting at 302. Therefore I shall now see how I did with my last set of predictions and also make my predictions for my next ten. Good times! What did I predict back in December of 2013? 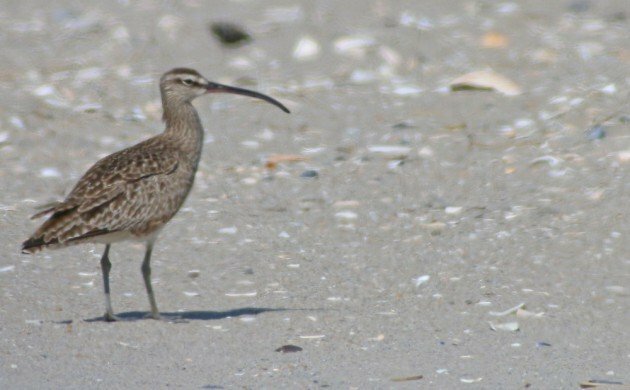 Whimbrel – Undoubtedly this is the easiest bird left for me to find in Queens. Buff-breasted Sandpiper – If it takes two years for me to get ten more, which I think it will, then I have two summers to find one. Sooty Shearwater – This will take some more dedicated seawatching. Alder Flycatcher – I have to remember to be looking in late May when these birds will most likely be moving through and hope for a westerly component to the winds on good migration nights. Black Vulture – Enough have been seen in Queens that I should get lucky eventually. The burgeoning population of Turkey Vultures in eastern Long Island gives me hope. White Ibis – They wander after they fledge. I just have to hope they wander to Queens and that I find them! Northern Goshawk – Probably the most likely raptor left for me to find in Queens. Eastern Screech-Owl – There are many just outside of Queens in Nassau County. Sometimes they are found in Queens, though sightings are few and far between. I should spend a couple of evenings in northeastern Queens playing tape and see if any respond. Sedge Wren – This is a bird that rarely shows up on the coast in fall migration. Since I put in many hours on the coast in autumn I should be able to track one down eventually. How accurate were these predictions? Well…let’s see. Here are the actual ten species that were numbers 303 to 312 with a bit of the story behind each one. Lapland Longspur – This bird should have been on my prediction list and was in previous attempts. Since I saw my first in February of 2014 at Breezy Point I have had two more encounters, both in February of 2015, both at Jacob Riis Park. Brown Booby – A completely unexpected sighting in August of 2014, the Brown Booby I spotted at very long range from the platform at Fort Tilden was not only my first for the county but my first for the state. 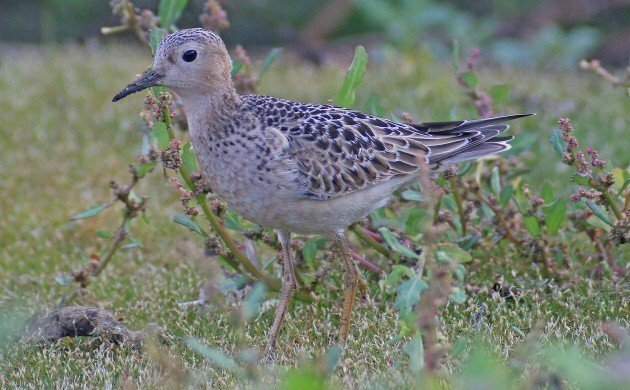 Buff-breasted Sandpiper – Yes! Finally, one that I predicted! This pair of birds on Jamaica Bay’s East Pond had been around for several days by the time that I got to see them in early September 2014. And were they ever cooperative! 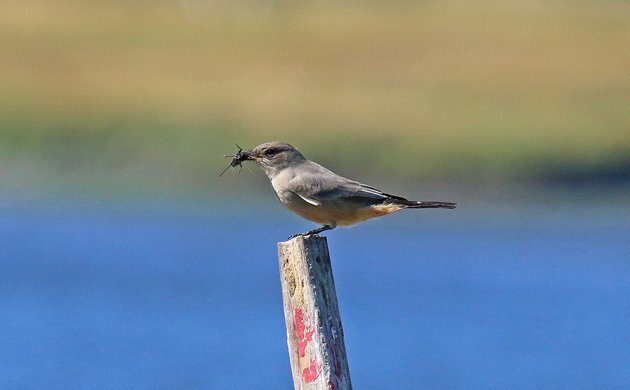 Say’s Phoebe – A self-found rarity at Edgemere while accompanied by my family made my day back on 05 October 2014. That others got to see the phoebe as well made me even more happy. And, no, I had no thought of getting one of these in Queens, and this was the first Queens record of the species. Golden Eagle – Two weeks to the day after the Say’s Phoebe I was once again at Edgemere with my family and picked up a Golden Eagle flying past, a surprise bird for sure! I am amused that I have Golden Eagle in Queens before Black Vulture or Northern Goshawk. Henslow’s Sparrow – Considering the decline that this bird has had in the eastern part of its range it is kind of a miracle that one was at Fort Tilden to be seen and considering how skulky they are it was even more of a miracle that it was found and identified. And, to show things come in threes, it was even more of a miracle that I convinced the family to accompany to see it and that birders were nice enough to wait around and help me get on the bird. I definitely did not think I would get a sixth Ammodramus sparrow in Queens. Eastern Screech-Owl – I had a pretty good idea that there should be some around and I was very pleased to hear a single Eastern Screech-Owl while out playing tape for our Christmas Bird Count. This record pretty much made my December and made up for the one that spent several years in Forest Park disappearing right before I moved to Queens. Whimbrel – The 14th of May was the day I got my first Whimbrel in Queens at Rockaway Beach, finally knocking off what was the biggest gap on my Queens list. A month later I saw another at Breezy Point. This Say’s Phoebe made me very happy. Brown Pelican, 3 Jul 2010, 11 Apr 2011, 15 May 2012, NOT YET SEEN! Western Tanager, 31 Oct 2010, NOT YET SEEN! Great Shearwater, 11 Apr 2011, 15 May 2012, 30 Dec 2013, NOT YET SEEN! Sooty Shearwater, 11 Apr 2011, 30 Dec 2013, NOT YET SEEN! Black Vulture, 11 Apr 2011, 30 Dec 2013, NOT YET SEEN! White Ibis, 15 May 2012, 30 Dec 2013, NOT YET SEEN! Alder Flycatcher, 15 May 2012, 30 Dec 2013, NOT YET SEEN! Northern Goshawk, 30 Dec 2013, NOT YET SEEN! Sedge Wren, 30 Dec 2013, NOT YET SEEN! Since I started playing this game back in July of 2010 I have predicted adding 35 species to my Queens list and have added 26 of them, leaving me nine that I have predicted that I have not yet found. But, in total, I have added 55 species to my Queens list in that time, which means that there are twenty that I never predicted! Some day I will see a Black Vulture in Queens. Probably not this well but I will see one! To make life easy for me, I shall use all nine of the species I have previously predicted in my predictions for my next ten species, which will get me to 322. That means I just have to come up with one more! Here they are, in no particular order, with my thoughts on not yet having found them and how I plan to do so. Brown Pelican – This is a bird that will just take some luck while I am staring at the ocean. Or, maybe, we’ll get a late fall visitor that is chaseable. Either way, the odds of actually getting a Brown Pelican in Queens are pretty low. Sedge Wren – There are records of this species in Queens, generally along the coast in fall. Here’s hoping I get lucky this year, or, considering how long it takes me to add ten new birds, next year! Alder Flycatcher – I have almost undoubtedly seen one of these birds in fall when they are silent and unidentifiable. They are late spring migrants, so I basically need to not go away next Memorial Day weekend and hope for southwest winds in the last third of May. Great Shearwater – At this point, seabirds are my weakest family in Queens with the most species having reported in the borough that I have not seen. I must stare at the ocean a lot. Western Tanager – Pretty unlikely but a guy can dream, right? 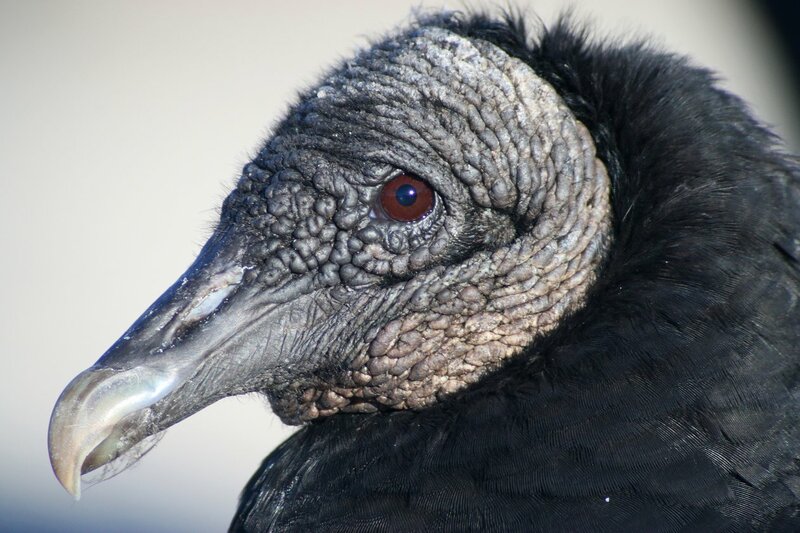 Black Vulture – The bird that has been reported the most in Queens that I have never seen. Maybe this fall I will spot one or, failing that, next spring! White Ibis – A pair of young was spotted in Queens a couple of years ago and it is just a matter of time before another shows up at Jamaica Bay. Northern Goshawk – This is the most likely raptor left for me in Queens. Late fall hawkwatching is fun and I will be at Fort Tilden a lot this autumn! Northern Shrike – I’m kind of surprised I have never stumbled across either shrike in Queens but it is about time I do so. I bet one shows up on the coast this winter. When do you think I’ll make it to 322 by? And do you think my ten predicted birds are the ten I’ll get? Here’s hoping I’m writing another one of these posts by this time next year…though it will likely be 2017! I’ll never see my first (or my second) Buff-breasted Sandpiper in Queens again but I still hope to see one in my home borough again someday! Your next ten birds list has two Western Tanagers on it, but maybe that’s symbolic of having at least one future sighting be something completely unexpected. Oops. I wish that was why. I inadvertently left White Ibis off the prediction list but that is back on now. That is a fantastic longspur photo, Corey: Hats off! I’m gonna go for a crazy longshot European vagrant. That way I’ll seem like a genius when it happens. There ya go. You can thank me when you see that little beauty. Smew would be awesome. Also, because they often kept in captivity, I would have a hard time believing it was a natural vagrant. Greater White-fronted Goose is a goose I should have. That and Barnacle Goose both. Though the former is more likely. The woodcock would make me lose my mind.